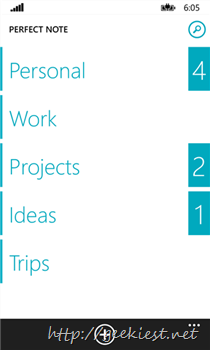 Perfect Note is a cool Note taking application for Windows Phone. This application have a lot features you will love. The application will costs you normally $1.99 but you can get this for Free with the MyAppFree. Set Reminders for items with repeat. Break ideas down in to smaller pieces and add detailed text and contacts (to call or send sms, email). Re-organize, share and delete items or sub-items. Simple, intuitive interface allows you to capture you ideas quickly and easily. 16 Unique and beautiful color themes. 3 security mode (password/pincode/pattern) to protect your info. Pin task to start with countdown reminder. One Drive auto backup, import and export data to make sure you never lose your info. Install MyAppFree from the Windows Phone Store. And install the perfect Note from the Windows Phone store.